The following items are open AROS bounties. This list is available here to spread the word and encourage other great coders like you to take the challenge and get rewarded for it while improving AROS. Some included apps are i386 and require activation exagear desktop which is available for a small fee. krystaldrop.i386-aros.zip gam/mis 0.7.2 18Mb 08 Feb 19 11 ¤ Krystal Drop - GPL-clone of NeoGeo's 'Magical Drop'. soliton-2.2.i386-aros.tar gam/car 2.2 2Mb 01 Feb 19 13 ¤ Soliton - Klondike & Freecell card game. hydracastle.i386-aros.zip gam/pla 1/2019 2Mb 26 Jan 19 14 ¤ HydraCastleLabyrinth - SDL platform game. bomns.i386-aros.zip gam/mis 0.99.2 1Mb 26 Jan 19 9 ¤ Bomns - 1 keyboard, 2 players, it's the bomb, with an n.
Paolo Besser has released an update of his AROS-distribution Icaros Desktop. 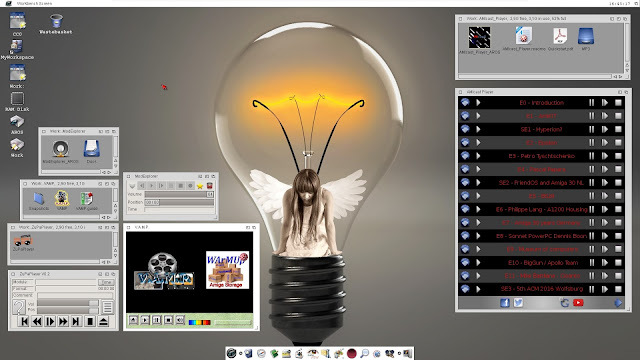 In version 2.2.6 the muimaster.library written by Neil Cefferkey was added providing "support for ESC-A method of embedding images into strings, which basically allows rapagui-based applications to show images into buttons and other GUI gadgets". Besides, now it is possible to record debug logs and updates of DCRaw, VIM and AmiCast Player were added as well as the ZuPaPlayer. Adding EasyRPG Player, "a great interpreter a la ScummVM for games created with RPG Maker 2000 and 2003" is supposed to be one of the highlights of the new version. Finally, for players the games "Kidnapping of Princess Pri" and "Grimps: Squeaking of the Dead" are now included. I'm glad to announce that the first public release of EmuLa is available for AROS i386. Built-in procedures can now support unlimited parameters (although only some have been updated to use this ability). Improved MUI & ReAction modules to use procedures with unlimited parameters (instead of immedate tag lists). So the C/C++ code generated for GUIs is now human-readable! Added the NoListOptim switch, so that the code generated for Immediate Lists can be more human-readable. AmigaOS4: Added the 'intuition/menuclass' module, aka "AISS menus", and the example program "Examples/Amiga/OS4_ReAction/MenuClass.e". When a bug exception was thrown during compilation, it could give the wrong message. Now fixed. Fixed a few module bugs. The package is rather big (1.6 GB packed, 9 GB unpacked). In version 2.1 of Icaros Desktop, the author Paolo Besser has fixed several bugs and added new versions of applications - e.g. a new version of the web browser Odyssey which now supports HTML-5-videos. Drivers for NTFS-3G and exFAT partitions have been completed as well. Additionally it is possible to access (read) Google-Drive accounts. Icaros Desktop adds a preference programm written in Lua for configuring it in a more comfortable way (screenshot). Enhanced AmiBridge's "Amiga as a service"
Krzysztof 'Deadwood' Śmiechowicz' latest beta update of Odyssey allows loading Google-spreadsheet and working with other applications (Draw, Drive etc.). Support for WebWorker was re-enabled and the internal threading support was changed to AROS POSIX-threads library. The diskcache also works properly. Porting it to AROS not only brings a lot of software, but it allows to quickly create new ones too, and to better manage the system, since Python versatility goes from fast GUI applications prototyping to system administration, from testing to astronomical big data analysis, and so on. Python can be considered the Swiss knife of computer science.